Along with rice and bread, this dish often accompanies our curries. We first started out making saag paneer, but found that as a side dish, we didn't need the cheese. Now we use chick peas instead. 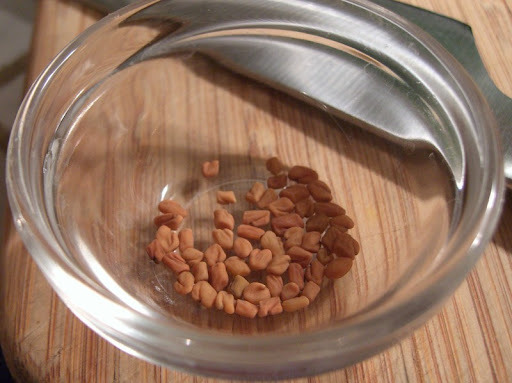 One key flavor of the dish comes from fenugreek, a strange little seed that reminds me of the achiote seeds we use when making cochinita pibil. Both have an intriguing deep, savory earthiness. After toasting the fenugreek in a bit of oil, we sauté onion with some cumin and then add roughly chopped fresh tomato along with minced ginger and garlic. The greens go in at the end. 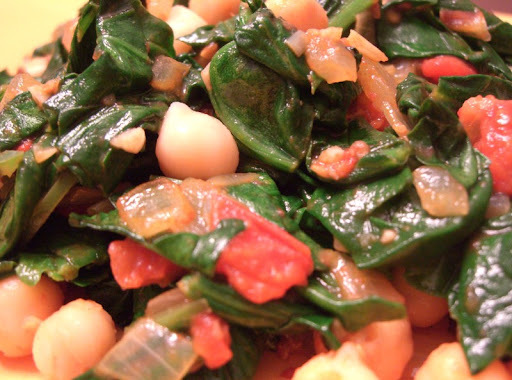 We most commonly use spinach, but we have used all sort of other greens with good results. 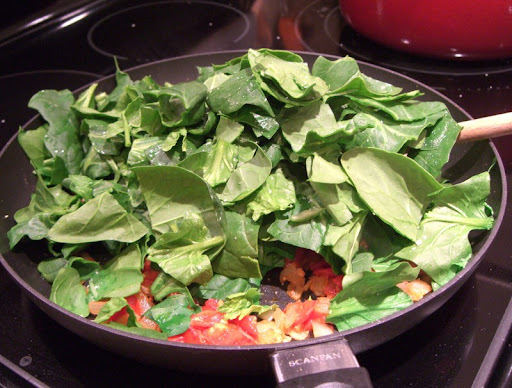 Don't be worried that you are using too much greens - they quickly cook down to almost nothing at all. Swiss chard, chicory (curly endive) or other deep colored cooking green can be used in place of the spinach. If using chard, be frugal when seasoning as it seems to have an inherent saltiness of its own. Heat oil in a fry pan. When hot, add fenugreek and stir for 30 seconds. Add onion and cumin, sauté until soft, but not browned - about 5 minutes. 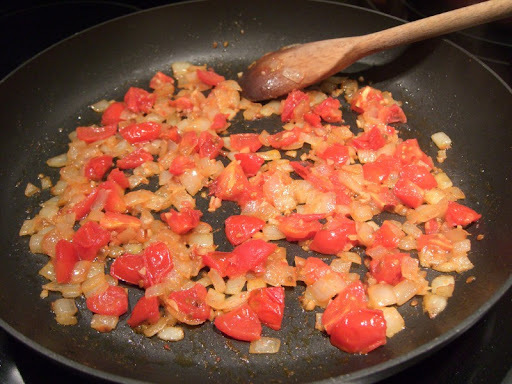 Add the garlic, ginger and diced tomato to the pan and cook about 5 minutes or until the tomatoes loose their shape and become less watery. Finally, add the spinach and chillies. Sprinkle immediately with salt to help retain the bright green color. 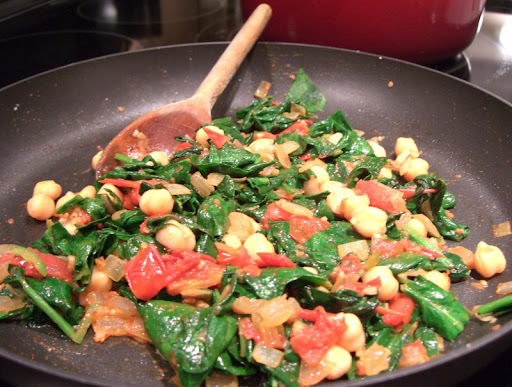 Once the greens begin to wilt, stir in the chickpeas and cook a minute or two longer. Taste for seasoning (chilli and salt), adjust if needed and serve. Have included your Saag as a model recipe in the One page cookbook at http://ramkicooks.blogspot.com/. Thanks Ramki. I visited your One page cookbook, and it looks like a great collection of recipes! I added a 1/4 teaspoon of Hang (Asafoetida) powder, gave it that extra element to the flavor.